Part 7 in a series of adventures seeking US coins in places where they are foreign. To get the feeling of being there, in Paris, with Mike Strub, traveling numismatist, try to read the following with a French accent – perhaps as the accent of the famous Jacques Cousteau…Ah, mon frere, it is again the time to tell of a coin trip to Paris. Loyal readers may recall that the first in this seven-part series told a story of the same travel destination. Now that his employer-paid travel has drawn to a close, to tell the story of the "second coining" there, it is poignant, is it not? C’est la vie. The last trip was a bust! As fun as my previous trip to Paris had been, it was numismatically a bust. Frankly, I had no desire to return to Paris, thinking that I had seen all I needed to the first time. But since I had no choice - a business meeting was scheduled there without regard to my numismatic preferences - I decided to make the best of the situation and investigate whether there were any stones left unturned. In preparing for my last trip, I had used the internet to look up coin shops. 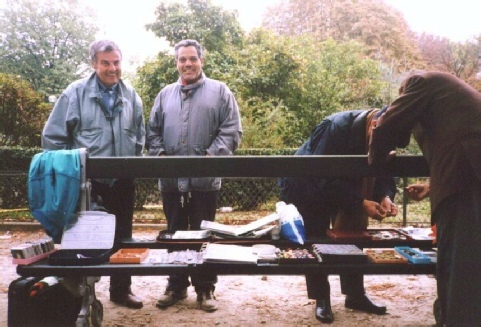 I remembered that there had been some rumor of an open air coin market or two in Paris, which I had never happened upon. I encountered a web page that hosted conversations about coin purchasing opportunities that explained that "every Saturday and Sunday" there is an open air coin market in "Rond Point Champs Elysees" - a circular drive in the middle of the famous Champs Elysees boulevard, where there is a nice park. Supposedly, foreign coins could be purchased by the kilogram there. And everyone that knows me knows I have kilograms of foreign coins that I like to sell for a dime apiece – here might be a potential new source of supply. Knowing where the coin market should be, I got my hotel to be within a few blocks of this site, and arranged to arrive on Friday evening despite the fact that the business meetings would begin the following Monday. I slept a fitful night, as much out of excitement about the next days’ activities as from trying to adapt to the new time zone and adjust to the fact that I had to share my tiny room with a co-worker in order to save my sponsor a little money. Saturday morning I struck out on my own to find this fabled market. It was right where it should be! But it seemed to be almost exclusively for stamp dealers. Imagine! 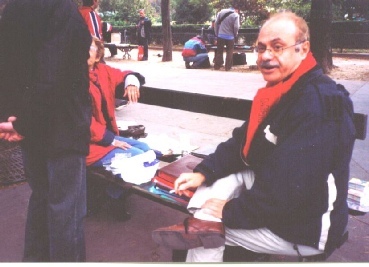 Dealing stamps in the open air, without even your own table – they had taken over all of the public park benches along the road, and laid out their wares on the seats. To view the merchandise, you’d have to get down on your haunches to peer at it. I wonder how the vendors worked when the wind picked up. I walked another half block, and finally found a coin dealer. What he had for sale seemed at first quite uninteresting – common, modern euro coinage in BU being sold for no less than double face, with the smaller coins costing a flat 25 euro cents apiece regardless of denomination. I turned to a junk box of foreign coins, and found very little. But the man himself was very friendly. His name is George Mahmoud, an Egyptian-born ex-New York cabbie, who to this day regrets his decision to move to France made 20 years ago. In France, he explained, no one can hold two jobs, based on the theory that this takes a job away from someone else. In New York, he could work as hard and as long as he liked, making all the money his efforts could earn him. Here, the only moonlighting he could get away with was his coin dealing. There had been a time, he said, when the authorities cracked down even on that in this park, but they were no longer doing so. George has seen 40 countries. Since his divorce, his teenage children have lived in Paris with him. They have American passports, but unfortunately, they have no interest in returning with him to the United States, and cannot speak English. So George feels trapped in France – at 53 he laments that it is too late for him to return to America. I spoke also with Mr. Robert Goodson, a Frenchman and a retired Ford employee, and Mr. Mahmoud’s good friend. He had some French type coins for sale. They were too expensive, but I bought a few, my strategy being to prove myself more than a window-shopper to what was evidently something of a brotherhood of numismatists out here. The strategy began to work, as Mr. Mahmoud then offered to me a seated liberty dime and better Barber dime, an early Morgan dollar, and a better Walker. I asked for more US coins, and he had none – so he introduced me to another dealer, Nicholas Charpentier (pronounced Nee-co-la Shar-pen-tee-ay). 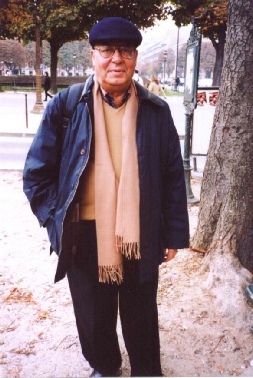 Nicholas was an unemployed French-Japanese translator. His bourse bench was nearest the corner, with vehicles driving by only 1-2 feet away from me. At first, I felt insecure at this bench, trying to keep an eye on my belongings and acquisitions while attempting to examine his. Then I began to notice something. Several individuals, including the dealers I had already worked with, and people who were apparently either their friends or customers, seemed to be keeping watch. It was a really nice feeling. It was like there was a brotherhood of coin people, watching out for each other. Nicholas had a lot of nice US type material to offer me. I was beginning to see that there is a very different idea of what makes a coin attractive to collectors there – coins must be clean to be marketable. Here, of course, we want the coin to look natural, uncleaned. There, brightness, whiteness, and freedom from accumulated dirt or spots was more important. I had to pass up many coins because of this unnatural cleaned look. While I looked at his coins, Nicholas began to present his religious and political views to me. Basically he had a great deal of suspicion of the governments of countries outside of France, because from his standpoint as an atheist, they are all contaminated with religion, the US chief among them. He told me that we "cannot judge Iraq" because, if we always say that we are going after the worst country, eventually it will be France that is so judged. I came back the next day to the same market and purchased more coins. I met a Mr. Simon – I never learned his first name – who was a retired French army man. In his travels he had visited most of the French colonies, and he had sought coins and paper money of all sorts while doing so. He told me he had many coins for sale that he could bring to me if I had time later in the week., so we made an appointment for him to meet me at my hotel on the following Friday. Mr. Simon was a true gentleman. I could see it in the way he spoke kindly to the maids in the hotel breakfast room, as well as to me. He opened up a large, heavy box of coins. I patiently filtered through it, but rapidly discovered that it was practically all coins from Monaco. I really don’t collect Monaco at all. Fortunately, I did find a nice Canadian dime, so his time was not completely wasted. Then he sold me some very nice American Military Payment Certificates – Crisp Uncirculated pieces. I needed these for my collection, but I was charmed into paying top dollar. He tried to offer me his collection of German inflationary currency, but as I scanned it, it appeared that the notes were all duplicates of those in my personal collection. As politely as I could, I declined, but complimented him on the quality of the notes. He insisted, saying "for your pleasure". I did not understand. Finally, he re-phrased his intent: he was GIVING me the collection. It was a gift! I tried to decline, but I could not do so without hurting his feelings. So I gratefully accepted them. Mr. Simon offered to drive me to the part of town where the coin shops could be found. And before we got into his car, he inquired about whether I had found gifts for my family yet. As I had not, he showed me a collection of pretty little bottles of perfume. My daughters would love them. During our drive to the coin shops, Mr. Simon explained to me the importance of loving all people. He then shared with me a little secret. He said that I would never hear another Frenchman admit it, but France was grateful that the US had removed Saddam Hussein from power. "After all," he said, "he was a bigger threat to us than to you." I thanked him for his kind words. 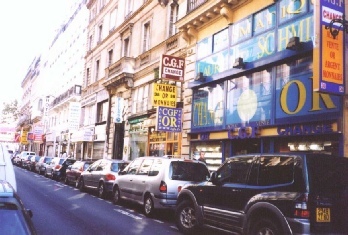 There are about 20 coin shops near the French Stock Exchange. I did a lot of window shopping, but saw virtually nothing to entice me to enter. The prices of the coins were entirely out of line with what I would have expected to pay. First, I had become used to the prices of dealers with no overhead expenses, using free public spaces. And second, I was dealing with a depressed US dollar. With the exchange rate of €5 = $6, the prices of their coins were that much worse. I regretted that I could not have come to France in the good old days when the situation was the reverse - €6 = $5, when the dollar was at it’s value peak. I would have cleaned up! Having rather more time to kill than I had planned, I decided once more to visit the area around the French mint. I didn’t need to see the museum again, as I had seen it 3 years earlier. The gift shop had nothing worth purchasing – much less affordable, to my mind - but there was an impressive display of bronze sculptures. I went down to the subway to return to my hotel, and re-discovered the beautiful decorations on the walls of the tunnel – huge reproductions of French coins, beautifully executed. 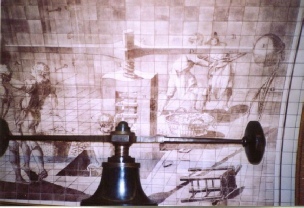 There was even a display of an antique coin press, and behind it, a diagram indicating how it had been used. The project I had been working on since 2000 – which facilitated the travels I have written about for you – has now officially ended. If I want to travel to a foreign country again, it will be on my own nickel. But that’s not the end of my coining stories! There are a lot of places in our own country and nearby Canada to write about – I think Nebraska would be a good place to start next time. For one thing, I already speak the language.